A visitor enjoying a casual evening stroll around the “Cathedral of the Peak” in Tideswell may pause in their tracks and be surprised to hear the full throated sound of a male voice choir emanating from the nearby ancient Grammar School. This is the celebrated Tideswell Male Voice Choir at their regular Tuesday rehearsal. The choir was founded in the early 1950’s by a small group of men from the village. This ensemble soon attracted new recruits from Tideswell and surrounding villages until, at the height of its fame it could assemble sixty voices for a concert. Tour highlights have included visits to Malta and Slovenia, while nearer to home, trips to Killarney, Cornwall and St Davids are memorable. The choir had the unforgettable experience of singing in the open air at the magnificent Minack Theatre and the Eden Project. The highlight of 2019 will undoubtedly be the eight day cruise to Scandanavia in September, when the choir will entertain passengers with two concerts on the cruise ship “Balmoral”. The choir is once again on the ascendant, attracting new members and with a new music team (musical director and accompanist). Our repertoire is eclectic (to say the least!) with contemporary pieces such as “Jersey Boys” , “Hallelujah” and “The Pirates of Penzance” together with more traditional material, the Welsh hymn “Gwahoddiad” and a beautiful Hebrew hymn of peace “Ose Shalom”. There can never be too many singers to deliver the wonderful unique sound of a male voice choir. In June of this year we are hosting four recruitment sessions, details of which are given in the accompanying advertisement. Anyone who has entertained even the remotest urge to sing is welcome. Don’t worry if you can’t read music (many of us can’t!) – We’ll show you what to do, and in any case you can learn your part from MP3 recordings which we’ll provide. If you would like to attend any of the sessions, please contact one of the choir members shown in the advertisement or turn up on the day. 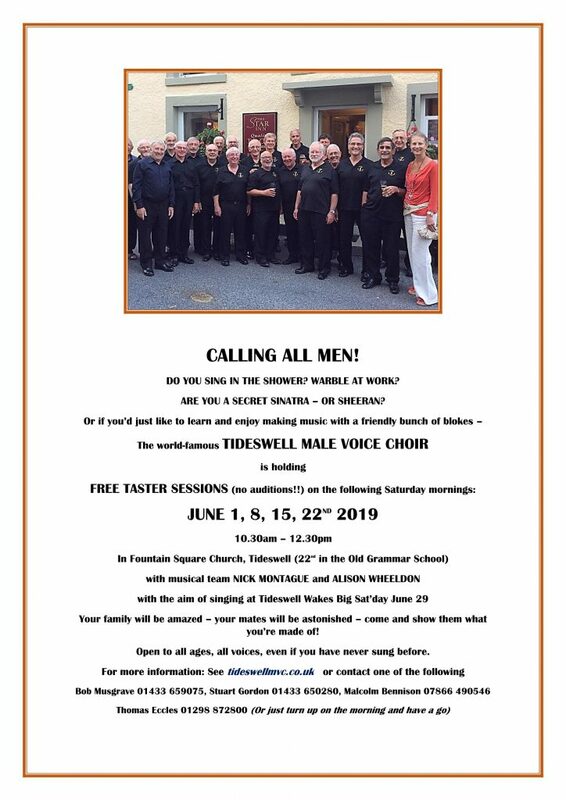 If you can’t make any of these sessions you will always be welcome at our Tuesday rehearsal night, held in the “Old Grammar School” Tideswell from 7.30 to 9.30 pm. By joining us, you will make thirty new pals and be assured of a very enjoyable and uplifting experience.